The first thing anyone will notice about Renaissance is it's unique art style. Done pretty much entirely in black and white, this things looks like a comic book or graphic novel come to life. And when I say black and white, I'm talking about true black and white, not the black-and-white like how we describe old movies and TV shows that don't have color, where they're black, white, and every shade in between. Nope, this movie has only black and white... with a few exceptions. Aren't there always exceptions? I did notice some grey in reflections and translucent holograms, but that's pretty much it. Next... the animation. This isn't hand drawn like Saturday morning cartoons or Japanese animation. This is animated using real live actors filmed against a green screen and then drawing over them just like they did with the film A Scanner Darkly . This makes the animation look extremely smooth and realistic, something you just can't get trying to hand-animate. Of course, hand animation works just fine too, so doing this live-action method is really just done for stylistic purposes. After all, whether it's traditional hand-drawn, computer animated, or this live-action animation, the story isn't going to change one bit. Ah, the story. Art and animation can be absolutely wonderful, but it doesn't mean much without an engrossing story. Unfortunately, the story here wasn't all that I had hoped for. It felt like I'd already seen it many times before. The atmosphere I know I had seen before, back when it was called Blade Runner. But this film is set in a future where some giant corporation sells ageless beauty. The scene is Paris in the year 2054, and some hot young scientist chick just got kidnapped. We really don't get to know who she is before her kidnapping, and this kinda hurts the story. After all, if I don't know this character, then I have no reason to care about her, or her safety. Since someone has to take the case, it might as well be some stereotypical "tough-as-nails" cop that we've seen only a million times before. Go forth, my veteran badass cop, solve this heinous kidnapping of a girl I know nothing about. Of course, this isn't just a kidnapping for money. If it was, there would be no need to set it in the future. Nope, this has something to do with a secret that could probably destroy society or something else along those lines. I won't give anything away, I'll just say it has something to do with the "ageless beauty" thing, which should be pretty obvious to anyone. Now, notice a couple paragraphs ago when I mentioned art and animation, I said "can be absolutely wonderful". Yes, it can be, but for me, this wasn't. I'm sure a lot of people will love this style, but after about five minutes I just got tired of it. I would have much rather seen this drawn and animated in full anime glory. Since it's only black and white, you pretty much see everything in shadow... which means you DO NOT see all the detail that could have been there. I'm sure a lot of people will disagree with me on this, but it's just my opinion. I'd rather see shades of grey than pure black and white, and I'd rather see color than either of those options. The sole extra feature on the DVD (I don't count "sneak peeks" as an extra feature) is a Making-Of, which is about 26 minutes long. Unlike the film, this doesn't have an English language dialog track. Now, anyone who knows me knows that I have no problems reading subtitles, in face I prefer to watch anime in Japanese with English subtitles... however... I have found that making-of documentaries are often better watched while doing something else, and that is hard to do when you can't understand the language being spoken. Yeah, I would like to HEAR about the making of this film, but I don't want to sit there and watch yet another scene of guys in motion capture suits or clips of the film that I just finished watching. So that's about it. Yeah, I was a bit disappointed. The box art was cool and I was looking forward it, but it ended up just not entertaining me very much. Head over to http://video.movies.go.com/renaissance/game/index.html to check out the all new online game based on the sci-fi/animated thriller Renaissance. 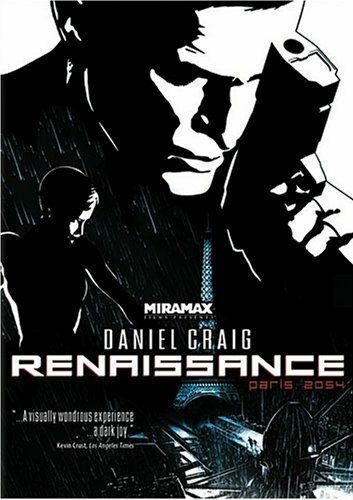 Set in the labyrinthine underworld of 2054 Paris, the black-and-white thriller in the vein of “Blade Runner” and “Minority Report” paints a bold vision of a stark, not-so-distant future where all life is monitored, recorded and regulated thanks to the city’s largest corporation, Avalon. Detective Barthelemy Karas, voiced by Daniel Craig (“Casino Royale”) has a reputation for finding anyone at any cost, but while tracking down a kidnapped scientist, he ultimately finds himself buried beneath Renaissance’s illicit world of corporate malfeasance and soulless genetic research. Critically celebrated actor Ian Holm (“Lord of the Rings”), “Braveheart” actress Catherine McCormack and Tony Award-winner Jonathan Pryce (“Pirates of the Caribbean”) also voice roles.